Black holes are one of the great terrors of the Universe. They're parts of space so dense that not even light can escape their gravity. Once you pass their outer boundary – the 'event horizon' – you're never getting out. Astronomers who study black holes have sometimes observed them gobbling up stars that unwittingly pass their way. But they're messy eaters – a black hole's intense gravity sometimes flings bits of star outward as the rest is consumed. Plus, as the stellar material is ingested, it heats up to millions of degrees and generates X-ray flares. Those flares are a handy indication for astronomers using orbital telescopes, but they're usually short-lived – typically fading to almost nothing within a year. Now, however, astronomers have published details of a flare that has lasted almost a decade – more than 10 times longer than any other. The diner in this case is a black hole named XJ1500+0154, which sits about 1.8 billion light years from Earth. To us, the whole thing just looks like a blob, but the artist's impression above shows what it might look like to a closer observer – with the ripped-apart star falling towards the black hole, emitting X-rays. The unusual length of the flare suggests that either this was the most massive star ever to be consumed in one of these events, or the first where a smaller star was completely ripped apart. 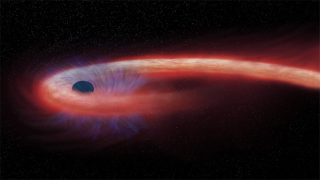 The researchers say that, based on their modelling, the black hole's food stash should begin to run out over the next decade, with the flare fading over the course of the next several years. The full details of the event were published in the journal Nature Astronomy.